For months now, my backyard has been a dull landscape of pea gravel and weeds with a naked plum tree in the middle. Practically overnight, the garden — I see it from my desk right now — has erupted in color: shocking pink peonies and rhododendron, purple iris, yellow roses and pale, newly green leaves. It’s the perfect time to drain my samples of two tender, warmer weather fragrances, Ann Gérard Perle de Mousse and Ciel d’Opale. Perle de Mousse and Ciel d’Opale (along with Cuir de Nacre) were created by perfumer Bertrand Duchaufour and released in 2012. To me, the Ann Gérard perfume style is classic, subtle and sophisticated. Despite the light, joyous vibe of Perle de Mousse and Ciel d’Opale, they feel made for full grown women (and discerning men, of course). Perle de Mousse is a green chypre that reminds me of a softer, gentler Balmain Vent Vert. Perle de Mousse’s notes include aldehydes, pink pepper, bergamot, green mandarin, galbanum, ivy, lily of the valley, hawthorn, Bulgarian rose, clove, jasmine, gardenia, lentiscus absolute (aka mastic), ambergris, musk and vanilla. Perle de Mousse opens with a dizzy whoosh of aldehydes, green galbanum and sweet, rather than tart, citrus. Moss is not far behind — the fragrance is resolutely a chypre — and thanks to rose’s juiciness and tuberose’s fruit, the citrus slips seamlessly into its spring-flower heart loaded with lily of the valley and a hint of spice. Perle de Mousse’s flowers are lovely, but the fragrance’s dose of moss gives the fragrance a whiff of fusty pencil lead that elevates it from pretty to beautiful. Perle de Mousse has definite sillage, but it wafts as sheer and light as chiffon. It lasts a whole evening on skin. Perle de Mousse would be ideal for May Day, spring lunches in bistros, and occasions that cry out for pink champagne (the good stuff). I’d been thinking I wanted a bottle of Ann Gérard Rose Cut, but Perle de Mousse tempts me. Perle de Mousse is wonderful in spring, but Ciel d’Opale feels made for summer. Ciel d’Opale’s notes include quince, lemon, galbanum, Sichuan pepper, cassie, jasmine, mock orange, honeysuckle, amber, cedar, guaiac wood, vetiver, sandalwood and vanilla. If Perle de Mousse reminds me of a softer Vent Vert, Ciel d’Opale could be a softer, better-mannered Amouage Ubar. Ciel d’Opale is a green, sunny floral lemonade with lots of honeysuckle and linden. Its cassie keeps it from being too pretty-pretty, although it’s still unabashedly pretty enough to charm someone who hasn’t smelled a lot of perfume. The fragrance sings in the higher registers and smells very femme to me. Instead of being overtaken by base notes, Ciel d’Opale’s honeysuckle-linden combo persists to the perfume’s last whiff on skin, about three hours for me. It would be perfect to wear with a sundress to an outdoor performance of A Midsummer Night’s Dream. 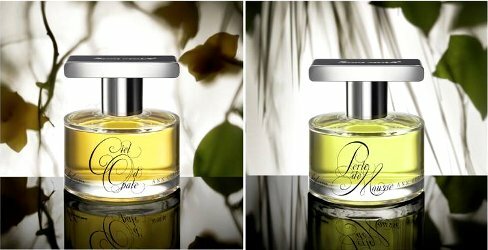 Ann Gérard Perle de Mousse and Ciel d’Opale are available in 60 ml Eau de Parfum for $165. For information on where to buy them, see Ann Gérard under Perfume Houses. Definitely not “frooty.” I’d love to know what you think of them if you get the chance to sample! They aren’t very easy to find here, either *sigh*. I think that Lucky Scent might be the only one to carrie them in The US? I have the original sample set but my initial interest was the Cuir de Nacre, and I never got around to spending much time with these two. It’s going to be unseasonably warm here in DC this week, so I’m glad to be reminded of these perfumes at such an opportune time. Cuir de Nacre was what grabbed me initially, too, and I more or less ignored these other two until lately. I’m sorry I waited so long to give them their due! Oh, no. MORE must-try scents, when the scent budget is on a diet . . . I know what you mean! My “must try” list is long, and heaven knows if I’ll even get to a fraction of them. Thanks for the review! I’m glad to hear that you were charmed by Perle de Mousse and Ciel d’Opale. I had the little mini set, and initially wanted the Cuir de Nacre, but that was in the end my least favorite. The other two are so pretty. I think the green of Perle de Mousse edges for the win for me, but I thoroughly enjoy both. The mini set at luckyscent was a nice way to have these, and I think it now includes Rose Cut. The mini set is a genius idea for being able to sample the line. I hope you enjoy the samples–or at least find them interesting, Perle de Mousse, especially. I’m jealous of your Rose Cut! You had me at quince. Quince quince quince. Cheaper than those L’Artisan boules, and smells even better! It’s pretty subtle here, but it sounds like you have a nose for quince! I love love love the Ann Gerard line. I believe she and Bertrand Duchaufour are longtime friends and it really shows, their collaboration is top-notch. Their styles seem to compliment each other and I can’t decide which in the line I like best, they’re all exquisite. When the original trio came out, I was so sure I was going to love Cuir de Nacre, but somehow it didn’t work for me at all. I remember that it smelled faint and stale and vaguely bitter on me, despite all those wonderful notes. But these two are lovely on me, especially Perle de Mousse. In our climate, I think it’s perfect for early summer. Thenk you for reminding me that I should dig out my small decant. You’re welcome! I ignored these two too long, as well, in favor of Cuir de Nacre (although it sounds like it played better on my skin than yours). Hi Angela, I find your blog super insightful and I understand everything you write, even though I might recall only 20 fragances that made me feel wow so far, and having only 5 fragances I consider my absolute favs. I wonder if you know any fragance with the scent of blossoming chestnut flower? In the starting summer I fall in love with the air full of this delicate smell and I wonder… where do I buy it? Is there any way/page/filter to look for a fragance giving your personal favorite scent? I’m not sure I’ve ever smelled a perfume that highlights chestnut flowers! You can always used the search bar on the right side of the blog, then specify “NST only” to see if it’s come up here. Also, I’ve noticed that the websites some perfume boutiques are allowing people to search by note. Best of luck!